The Cuisinart Chef's Classic Stainless Cookware Set is a 11-piece cookware set has a premium stainless steel that offers optimal cooking performance. The three-layer base design features an aluminum core for quick and even heating. The classic stainless steel cookware is compatible with all stovetops, including induction, to fit each individual's cooktop preference. The Cuisinart 11Pc Set Stainless Color Blush has many exciting features for users of all types. 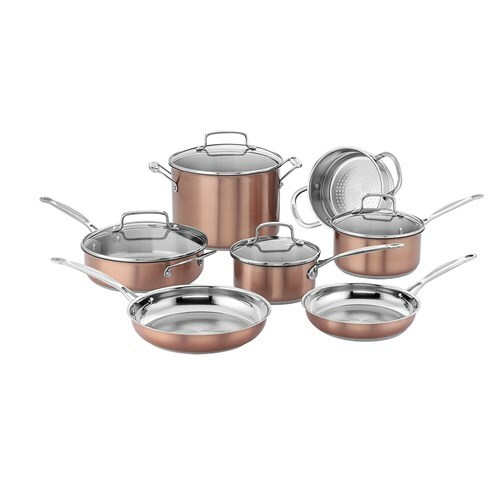 You can extend the lifetime of your Cuisinart 11Pc Set Stainless Color Blush with the purchase of a FactoryOutletStore Factory Protection Plan. 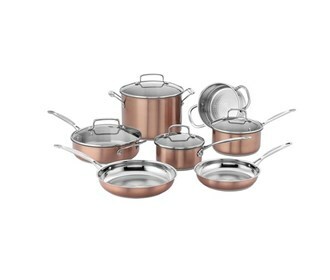 See the Cuisinart 11Pc Set Stainless Color Blush gallery images above for more product views. The Cuisinart 11Pc Set Stainless Color Blush is sold as a Brand New Unopened Item.